For generations, barbershops and beauty shops have been the cornerstone in the African American community. These spaces serve a greater purpose beyond getting a fresh hairstyle. They serve as a space to have unadulterated conversation on topics from relationships to politics and everything in between. 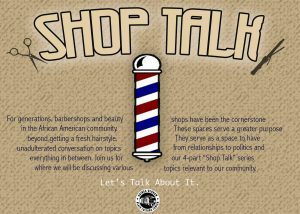 Join the GOBCC for our 4-part “Shop Talk” series where we will be discussing various topics relevant to our community.